Something unexpected marked the opening of Thursday evening’s concert by the Knights at Ozawa Hall. As soon as the youthful orchestra had tuned and the expectant audience had gotten settled, a violinist moved to the center of the stage in front of the orchestra and began to what all quickly recognized as La Marseillaise, but in a slow, unusually poignant version. Not everyone had heard the evening’s news, but all quickly realized that something unusual was happening, and not just a tribute to Bastille Day, which would normally be much more festive. Within a phrase or two people began to rise; soon the entire audience was standing; and some started quietly humming the well-known tune. Eventually the words could be made out as well, sung sotto voce from various parts of the hall. Aux armes, citoyens! The violinist came to the end of the performance, followed by a few cries of Vive la France! and some applause before everyone sat down again. Eric Jacobsen, conductor and cellist of the ensemble announced that, owing to the attack that had just taken place in France, the orchestra would dedicate its performance to their friends there. The Brooklyn-base Knights describes itself as an “orchestra collective” that grew out of chamber music reading parties at the home of Eric Jacobsen and his violinist brother Colin. The group includes musicians with classical training, as would be expected in a symphony orchestra, but many members are also active in a wide range of other musical activities: composer-arrangers, singer-songwriters, improvisers, with experience in jazz, klezmer, pop, and indie rock music. Their programs—including Thursday evening’s—regularly involve stimulating mixes of many different types of music assembled according to some theme or image. The Knights is but one of a number of new models of concert orchestras offering programs that may include traditional classical works as well as premieres that often blend classical and popular musical styles. Last night’s theme, something on the order of “changing times” structured each half to open with a crisp, astute, well-shaped performance (led from the concertmaster’s chair) of a classical symphony: Haydn’s Symphony No. 64, with the heading “Tempora mutantur” (“The times are changing”) and after intermission, Schubert’s youthful Symphony No. 5. The rest of the program consisted of more recent works from the Great Depression to the present day. 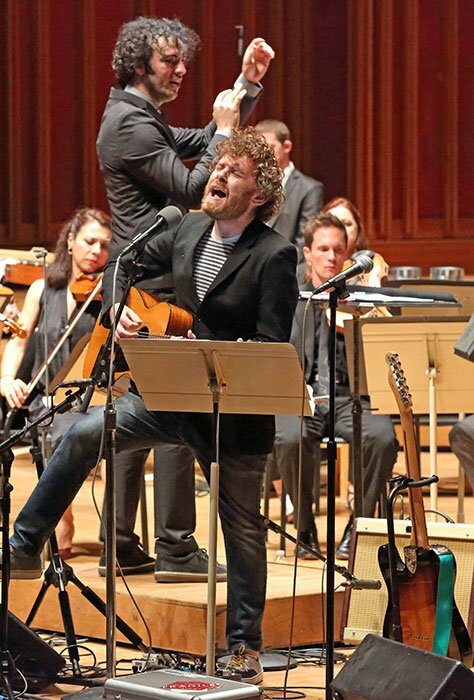 The newest work was an orchestral song cycle by Gabriel Kahane, a singer-songwriter who regularly mixes classical and pop elements in his music. (He gets his classical roots from the fact that his father is the pianist and conductor Jeffrey Kahane.) For his Crane Palimpsest he played the acoustic guitar, electric guitar, and piano, while singing (in a pop-style voice, into microphones). Kahane framed the work as a setting of Hart Crane’s great poem The Bridge, which he divided into five separate movements; interspersed between each pair of movements is a song (four in total) in a more pop-oriented style to his own words. This insertion of new art on top of old constitutes the “palimpsest” of the title. The flow of styles from one section to another was accomplished with a flexibility and interaction that creates a near fusion of these musics, not simply jerking from one to another and back again, but growing, responding, developing a rich panoply of orchestral sounds against which the words were sung. It is a piece that I would very much like to hear again to parse the way these elements grow and respond to one another. But next time I would beg for a sheet containing the texts (surprisingly not included in the program, even as an insert). Even with the microphone, the orchestral sonorities often drowned out the words, particularly because Kahane’s vocal presentation seemed more directed to the microphone than projected directly to the audience as a classically oriented singer would do. Crane Palimpsest is fascinating and often gorgeous piece, but I want to understand the music’s contribution to the expression of the poems. Two elaborate arrangements of pop songs from the 20th century, and one internal encore remained. First came a brilliant jazzy orchestral elaboration of “The Big Noise from Winnetka,” a 1932 song by Bob Haggard and Ray Bauduc (members of Bob Crosby’s “Bob-Cats”), arranged by the Knights’ bass player Shawn Conley. Then, as an unlisted extra, came a tribute to the late David Bowie, “Heroes,” with the addition of singer Christina Courtin. An extended version of Bob Dylan’s “The Times They Are A-Changin’” arranged by Colin Jacobsen and sung by Christina Courtin and Gabriel Kahane closed the concert. The Knights have developed a broad audience that appreciates the imaginative programming musicality and range of style and material. Combining works from Haydn to Kahane and Dylan, and playing them all with first-rate expression and chops expands their reach well beyond standard subscription ticket-buyers. Thanks for your kind words. For what it’s worth, I had submitted the complete libretto to be printed several months ago, but for some reason, it didn’t appear in the program. Alas!